Elegance will sweep into your kitchen or dining room display with this decorative side chair. Taking on a vintage cottage style, this chair features a trending look that will remain timeless. It is styled with simple shapes and lines that are accented by bevels and nail head trim. 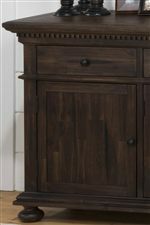 The Townsend Rustic Brown finish over the acacia veneer and solid construction creates a warm and antiqued tone with a semi-matte finish. This chair is complete with upholstered padding on the seat and back.